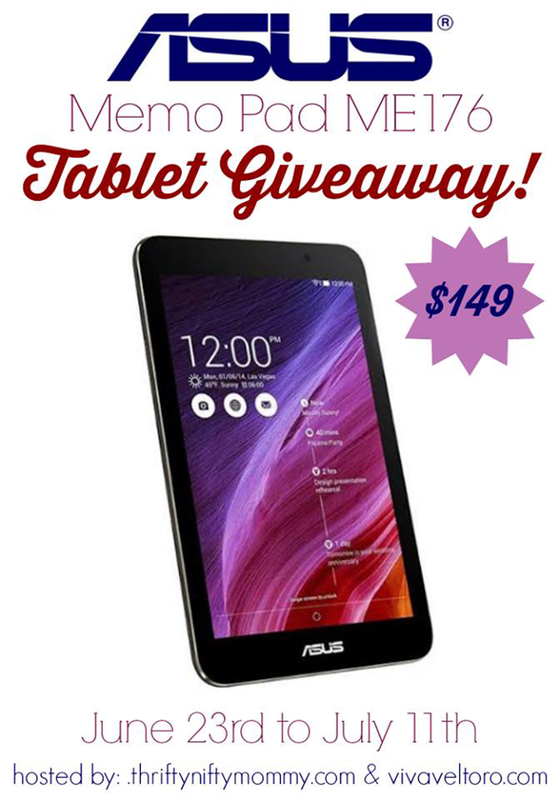 We are giving away an awesome ASUS MeMO Pad ME176, sponsored by ASUS and hosted by Thrifty Nifty Mommy and Viva Veltoro. This little gadget is great for the home or office and small enough to take on-the-go. Enter to win below and see if you’ll be the lucky winner of this ASUS pad! Good luck everyone! My mom could use a tablet, I would give it to her, if she already gets one, then my daughter. I would love to win this tablet.I had one but it got stolen. I’d like to win this because it would make a great gift for my BFF. Thanks. I would love to win one because I don’t have a tablet and this one looks awesome! My PC is not working very well, it’s over 9 years old. This would be such a wonderful replacement! My kids have taken over my iPad … both of my iPads! And my tech-guru son says ASUS is outstanding. I would love to hand my Apple products over to my kids and never need to “borrow” them back! I would love to win this tablet so that I can get online in other rooms other than using my desktop. This would be great to travel with and great to bring with me on the go. I would love to win this so I can surprise my husband on his birthday. I want to win this to replace a really older and cheaper tablet that I have. It has lots of great features on it.